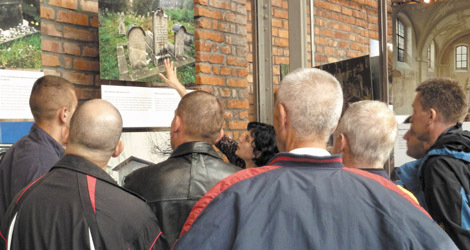 In 2003 Jewish community leaders in Poland approached the Polish prison service with a radical idea – using inmates to preserve and maintain the country’s many neglected Jewish cemeteries and monuments. This was the beginning of the Tikkun Project (‘Tikkun’ is Hebrew for ‘Reconstruction’), a programme that has had a striking impact both on the state of the nation’s Jewish heritage sites, and the attitudes of those involved in the work. Tomasz Wacławek, spokesman for the prison service in Krakow, spoke to the Krakow Post about his great enthusiasm for the Tikkun Project and its popularity among inmates. Polish prisoners attend a lecture on Jewish culture given by Michael Schudrich, the Chief Rabbi of Poland. 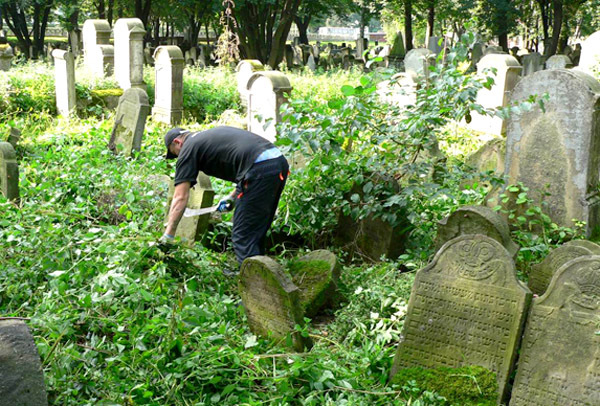 The prisoners clean Jewish cemeteries and repair broken headstones. They also visit museums featuring Jewish exhibits, tour extermination camps and sites of Jewish heritage and eagerly watch plays and films about Jewish life in Poland. One prisoner, who helps at a museum in Chrzanów, has even compiled a list of the names of the 1,500 of the city’s Jews murdered during the Holocaust. Wacławek is proud of his role in helping to organise the Tikkun Project together with the Jewish community. He argues that the programme has introduced inmates to a whole new world of tolerance and shown them how prejudice can lead to tragedy. “The programme is a co-operation between local authorities, Jewish communities, the Israeli Embassy in Poland and the local institutions that help to finance it,” said Wacławek. He also points out that, although Tikkun activities take place outside the prison walls and are supervised by museum and cemetery staff only, not one prisoner has tried to use this opportunity to escape. “They really love this kind of work, and every year thousands of prisoners volunteer to take part in its different activities,” he said. Krzysztof, 45, is serving a sentence for murder in a prison in the small town of Trzebinia, about 30 kilometres west of Krakow. He has been in jail for eight years and will serve another three before he is scheduled for release. Six months ago he started working at the Jewish museum in Chrzanów as part of the Tikkun project. He assumed responsibility for the old Jewish cemetery in the town and, using his skills as a computer programmer, took it upon himself to update and develop the museum’s web site – especially the section concerning the cemetery. Krzysztof says he has discovered a world he did not know existed, and that his work on the project means he will leave prison a better person. “I did not have much knowledge or many opinions about Judaism before, simply because I had never met a Jew. Everything I knew about Jews I learned from conversations in school or from the Old Testament. Now, after spending six months studying Jewish history and Jewish culture in Poland, I have discovered many beautiful and interesting things,” he said. Krzysztof is aware that Poland has a reputation for anti-Semitism in some quarters, and believes that this is because Poles do not know enough about Jewish culture. For this reason he encourages fellow prisoners to take part in the Tikkun Project. A Polish prisoner tends to a Jewish graveyard as part of the Tikkun project. Chief Rabbi Rabbi Schudrich has been lecturing prisoners like Krzysztof for several years. He teaches them Jewish history, traditions and customs, and even Jewish ‘Halakha’ law, so that they are aware of restrictions and requirements relating to cemeteries and the dead. Wacławek has dozens of photos of prisoners listening attentively to these insights into an alien culture. Magdalena Wojtyra is another key figure in the Tikkun project. As a psychologist for the Polish prison service, she is the one who selects inmates to take part in the programme. She told the Krakow Post that participation is strictly voluntary, but that almost nobody refuses the opportunity to take part. “Out of the thousands of prisoners who have been offered the chance to participate, only one has refused… All of those who have decided to take part, wish to continue. I have never heard a negative remark from any prisoner. It works like this: once the prisoners meet with the staff of a Jewish museum, they are sold on the project and come to me with a request to work in that museum,” said Wojtyra. anti-semitism? It was completely unnecessary. How about a discussing anti-Catholicism by certain segments of Jews, it does exist, one can easily see this and it is highly visible in the media today. I also feel many Jews should learn more about Polish culture and the Catholic religion, and the over 1000 years of Jews living in Poland due to the country’s historical tolerance and that Jewish religion and culture thrived in Poland like no place else. How come this end of the spectrum is never discussed or mentioned in the mainstream news? Is it too taboo or politically incorrect to do so? Thank you for your comments, Anna and Ema. I really do appreciate your taking the time. The expression “reconstructing attitudes” has a chilling Thoughtcrime ring, and to me that signalled that this would be a Politically Correct article. And my experience of PC, as a Polonian, has led me to expect that something nasty about Poles/Poland/Polonians would follow. Anyway, I think I had better take myself off and read Psalm 37 – and cool down. And on the silver lining side, this makes me more and more grateful for the perfect advice and the wonderful promise of a rescue contained in the Hebrew and the Christian Greek Scriptures, for which I thank the God of Abraham, the true God. There is going to be such a different system of things on the earth when we are ruled over by the heavenly government – the “kingdom of priest and holy nation”. Then the earth will be ruled by the law of loving-kindness. Oh and let take a moment to thank all the Hebrews of old who so faithfully and capably transcribed God’s word down the generations. I hope that when they wake from the sleep of death they will be so happy to know how much that faithfulness has helped us. How about a discussing anti-Catholicism by certain segments of Jews, it does exist, one can easily see this and it is highly visible in the media today.